i have no idea why bandhanis are so colourful but i keep thinking the arid lands where the craft grew, the desert all round, the dry parched earth, the overdose of browns and ochres might have had something to do with it. a burst of happy colour to take on the sombre hues, perhaps a note of defiance in them. 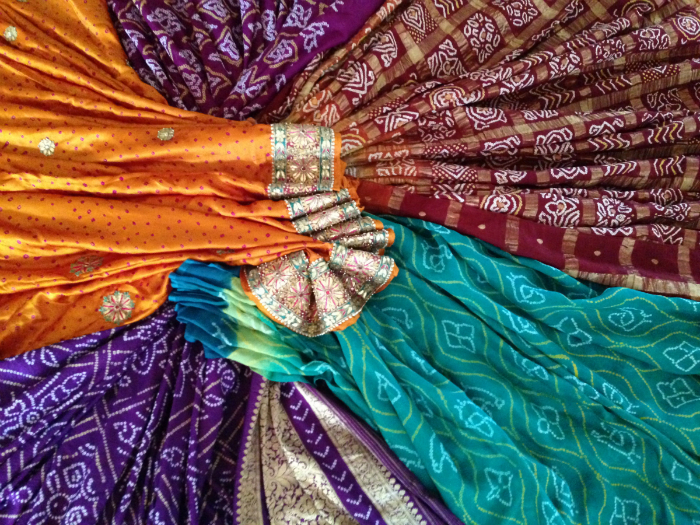 in the western states of gujarat and rajasthan, bandhani, bandhej or tie and dye has been a way of life practically for centuries. it all most likely started in ancient sindh. my internet delve says you can see signs of this fine and almost funky art in the cave paintings of ajanta; and even the people of mohenjodaro were probably into this intricate method of printing fabric. i’ve never been to gujarat but rajasthan to me is sand dunes, palaces, brown earth, wide open skies; and against that, brightly coloured ghagras and odhnis, gleaming silver jewellery, girls swaying gracefully in their blues reds greens and yellows along a brown stretch of land balancing fat round matkas on their head, peacocks, the sound of ektara as a father plays it in a side lane at the jaisalmer fort while his tiny daughter in flared pink ghagra circles around giddily, dancing nonstop. not fairy tale, rajasthan when i last visited in 1988 was really still like that. a streak of flagrant colour against a sandy terrain with jutting rocks and thorny bush, to me that’s so rajasthan. maybe gujarat too, especially the kutch region out in the extreme west. 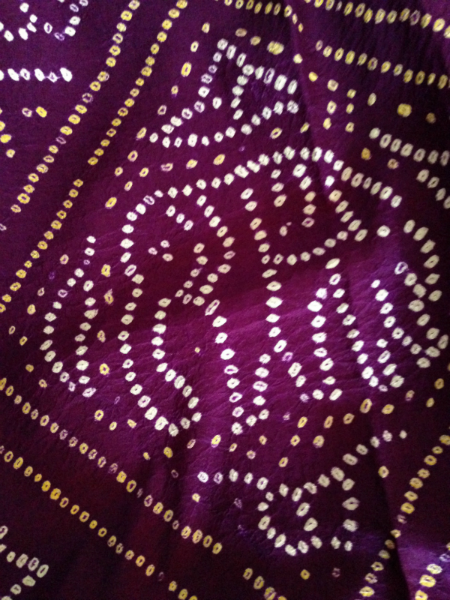 the finest bandhani they say comes from kutch, where the khatris are the experts at this technique of resist dying. 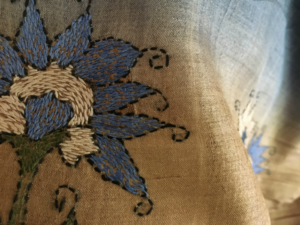 the basic process involves tying several tiny little bunches of the fabric to be coloured with string and then dying it, so the tied parts remain undyed. these white irregular dots are arranged in a way that they form patterns and motifs. the smaller the dots and more complex the palette, the more valuable the work. 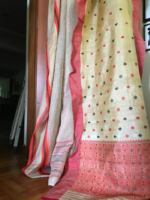 growing up in delhi, i took bandhani for granted, in fact at one point it felt a little same old same old, but all that changed swiftly when i saw kutchhi bandhani for the first time. something fey and heady about the whole thing. no rigid symmetry, great play of colours, and the fun of those endless knots that are still tied when you buy a piece. untie them and it’s the springy touch of the fabric, that crinkle that clings to it along with an elegance that isn’t stuffy in any way. 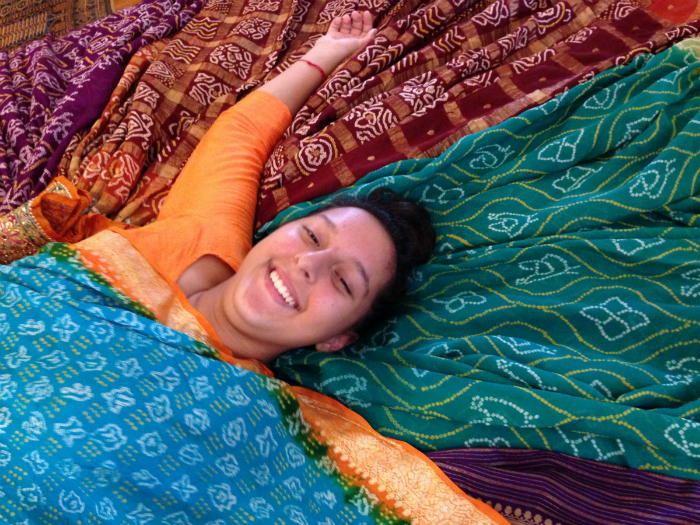 no nose high up in the air thing to the bandhani, instead it’s unabashed playfulness. the pattern, in fact, is revealed only after the knots are undone. on a trip to bombay a few years ago, i persuaded a dear friend to take me to this very well known shop called khatri’s to buy the real thing. i’d not been there before and had no idea what to expect. when the car started taking turns into narrow alleys and reached a row of shops that looked like hardware stores: seriously grimy, dinghy, utterly messy, i was aghast. we leaped out and entered a narrow passageway, a bangle shop on one side, barely any room to move. i had to buy some garish bangles of course. then we went up a flight of rickety stairs, finally a door was reached, a gruff looking man sitting outside looked my friend and me up and down and sullenly opened the door. we stepped into this largish room: the shop. you had to take off your shoes and join other shoppers on a humongous mattress stretching across almost the entire floor. and then not very good looking men proceeded to show you stunning sarees that they often fished out of large bundles stacked atop shelves, behind cupboards, beside the door, just about anywhere. khatri jamnadas bechardas of no. 2, 3rd bhoiwada, gulalwadi corner, despite unsavoury location is one of Bombay’s best known saree stores; my gujarati friend said for weddings and big occasions you had to come here. 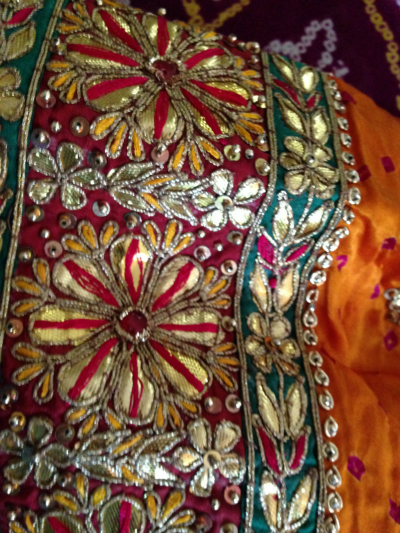 i learned about the typical gujarati wedding sarees, the gharchola and panetar there. 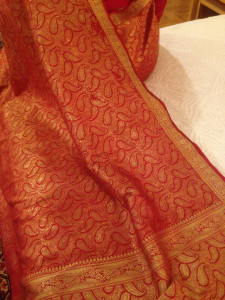 every time i hear of our saree traditions i am struck by how little i know and how rich it is. 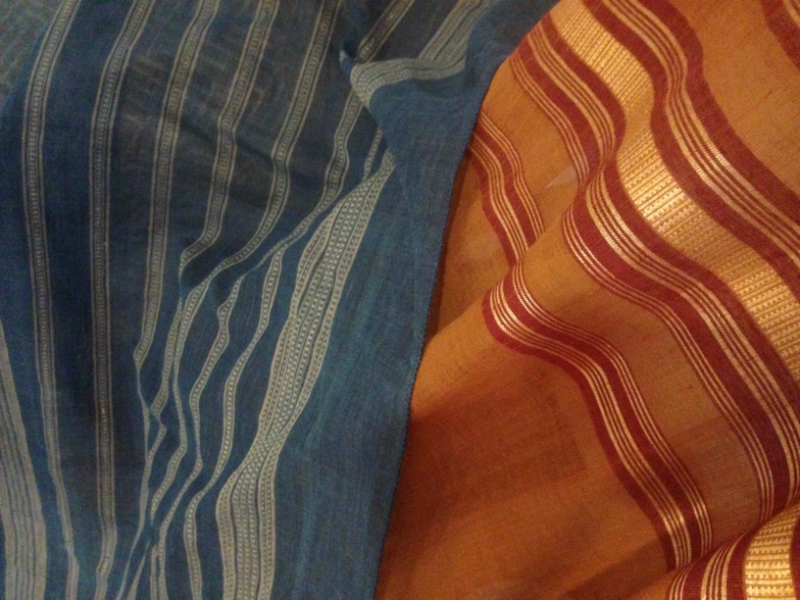 i picked up three sarees, one of them a gharchola with wide zaree checks. 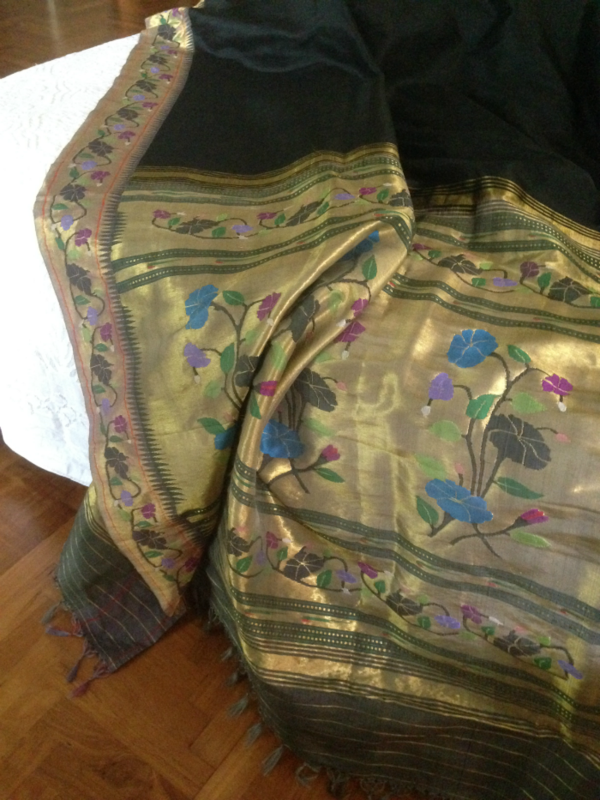 if you wish to present it to a bride from the bridegroom’s side you’d get heavy zardosi borders stitched onto the saree. 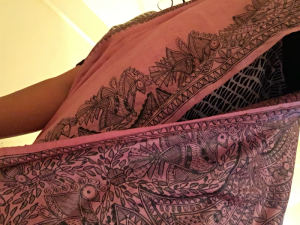 the shop usually gets all the knots taken off and the saree ironed. but in a stylish quirk, the pallu is not ironed, it remains “crushed” and sways prettily. another friend of mine whose home is in jaipur got me a couple more bandhanis, one of them with rather loud and very typical gold gota work. i remember she told me how surprised she was to see large, not so young women wearing these vibrant sarees at wedding functions and not looking overdressed or bizarre at all. in fact, she couldn’t bring herself to buy me a toned down, more “sophisticated” shade. i know the feeling… the colours literally call you. 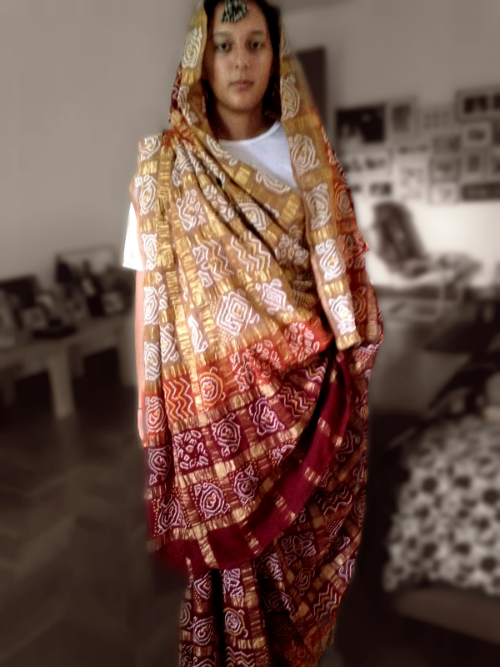 the word “bandhani” comes from the sanskrit “bandhan” which means tie. bandana is most probably derived from bandhani, it used to initially refer to spotted head scarves in blue, red and other tie and dye shades. 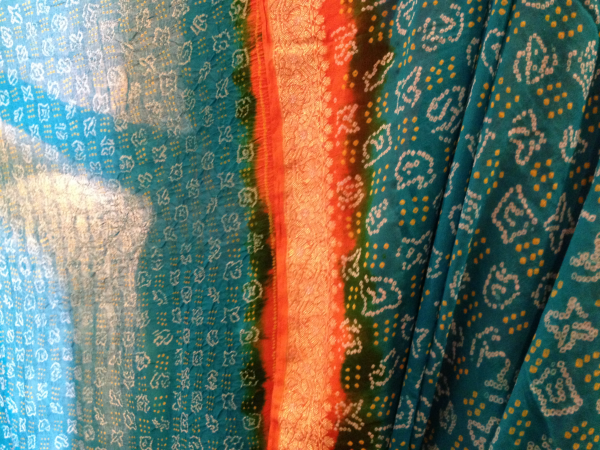 sarees tell sories | gharchola and other bandhani sarees from khatri jamnadas bechardas, bombay and jaipur. a gharchola minus elaborate border. 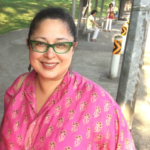 you know khatri’s? ohhh, the place is something else. thanks so much… the girls look so pretty, yes, as if nature has no say over their beauty, that swaying walk. the first time i went to rajasthan, must have been 14/15, i remember staring at the women. all that colour. glad you read this one.